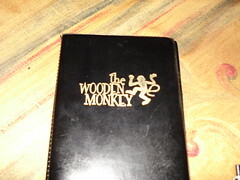 Nova Scotia Vacation Part 2: The Wooden Monkey | Mmm, Tasty! Before leaving for Halifax, Rich and I knew we’d need a list of at least a few decent vegetarian-friendly restaurants. While Halifax has really improved over the last 11 years since I lived in Nova Scotia, it still doesn’t have the huge selection that we’re used to. So we wanted to come prepared. Both of us have recently gone back to a vegetarian diet, although on this trip we allowed ourselves to have some fish. After all, the Maritimes are known for their fish! 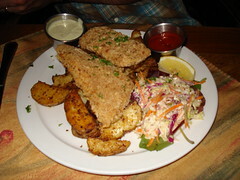 A search on Happy Cow turned up a decent list of veggie-friendly places, including this gem, called The Wooden Monkey. 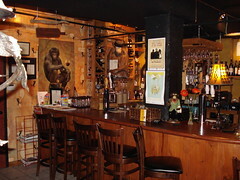 The Wooden Monkey has been open since the summer of 2004. Housed in an old stone building on a fairly tourist-y bar and restaurant strip, their concept is good food based on local, organic, fresh ingredients, with a focus on healthy dishes. This isn’t to say that the entire menu is healthy, of course, but rather that they don’t deep fry, they don’t slather everything with oil, cream or butter, and they offer alternatives for vegans and those on a gluten-free diet. Upon entering you’re greeted with a cute bar that has at least a dozen different monkeys around it – monkey pictures, monkey statues, monkey trinkets. It sounds pretty silly, but it’s really a lot of fun, and the pieces they’ve chosen blend in well with the rest of the decor – a nice wood bar, simple wood tables and chairs, clean white plates, and your standard glassware. The menu contains a lot of comfort foods cooked in a healthier way. They’ve got burgers, sandwiches, pastas, soups, and other bistro type fare. They also have a fully stocked bar and several local beers on tap, including ones from Garrison and from Propeller. Rich started with the vegetable rolls, which were rice paper rolls filled with vegetables and served with a mildly spicy peanut dipping sauce. My starter was the Japanese dumplings, filled with vegetables and tofu and served with a chili sauce. We both enjoyed our starters and found the portions to be reasonable. Rich’s main was the fish and roasties, which is their healthier version of fish and chips. His fish was flaky and delicious, with a crispy exterior. The roasties are a good substitute for french fries – roasted potato wedges with olive oil, herbs and spices. They’re just salty and just crunchy enough to take the edge off any salt cravings you might be having. My main was their lentil burger, served on a pita made in-house with honey mustard mayo and some of those roasties. I found the burger had good flavour, but I didn’t love the bun. I think if we’re ever there again, I might ask for a more traditional bun, if they happen to have something of that sort available. 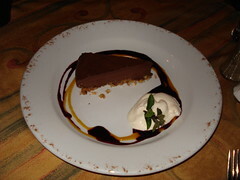 For dessert we shared their most popular item – chocolate tofu pie with a cinnamon, walnut and almond crust. The pie is non-dairy and vegan, as long as you ask for it without whipped cream; as you can see from the photo, we got ours with the whipped cream. It was delicious, and I’d happily order it again any time. Other than the food, the real highlight of the place was our server, Matt. He was very well-versed in the menu contents, and a quick conversation with him determined he’d been a professional server for a few years; the evening we were there, Hurricane Kyle hit Nova Scotia, and he mentioned that he was working at another restaurant the night that Hurricane Juan hit back in 2003. His experience and knowledge were also evident as Rich discussed beer with him. That was our first evening in Halifax, and we had not yet learned about the local breweries. Matt was quick to tell us about the merits of some of the offerings from Garrison vs Propeller, including a discussion of IBUs (International Bitterness Units, or in other words, how ‘hoppy’ the beer is) . He even gave us a small sample of Garrison’s IPA, which has won awards for the last two years at the Canadian Brewing Awards. Nice. I do have one small bone to pick with the place, though. Their menu is very vegan and gluten-free friendly, I don’t dispute that, but their labelling of vegan items isn’t as good as it should be. All items that are vegan are supposed to be marked with a ‘V’, however, there are items that clearly are not vegan, as they contain cheese or mayo. The reality is that those items aren’t usually vegan as written, but you can request that they be made vegan, and the chef is more than happy to do so for you. Even with the small snags, we still highly recommend this place!